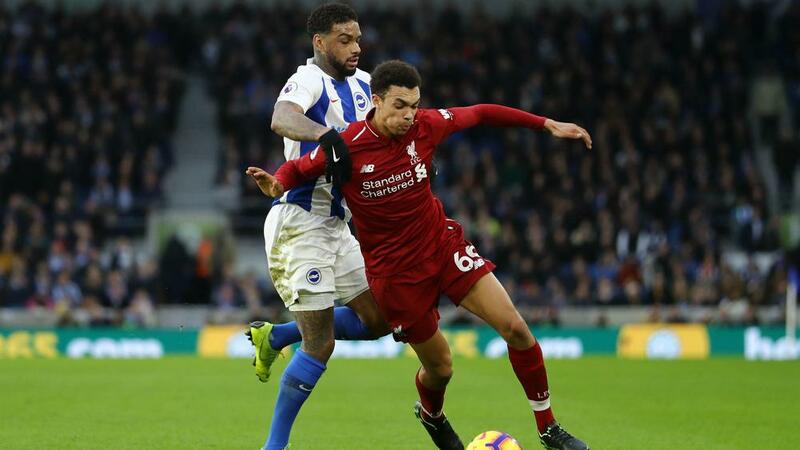 Trent Alexander-Arnold revealed the extent to which he patched himself up after turning an ankle during the warm-up for Liverpool's 1-0 win at Brighton and Hove Albion. Mohamed Salah won and converted a 50th-minute penalty to get the Premier League leaders back to winning ways in the top flight following last week's loss at Manchester City. Jurgen Klopp is already coping with a sizable list of defensive injuries – Fabinho was pressed into action as an emergency centre-back at the Amex Stadium – and was clearly worried when he saw Alexander-Arnold go to ground during the final stages of Liverpool's preparations. "I have no idea [how serious the injury is], we have to figure it out now. It was a shock in that moment – probably the last situation of the warm-up," said Klopp, whose side moved seven points clear at the summit once more. "He is on the ground, he wants to play. Because he doesn't speak immediately that's not so good. "We have to wait to see what it is now. But it was a brilliant decision of the doc and Trent. They told me he could play and he played well." England right-back Alexander-Arnold presented his own prescription that Liverpool's medical staff were happy to go along with, allowing him to complete 90 minutes. "I told the manger and the medical staff I needed a strapping and a few painkillers and I'd be good to go," he said. "As the game goes on you forget about it." Liverpool captain Jordan Henderson felt Alexander-Arnold's contribution to Liverpool's latest clean sheet spoke volumes of the 20-year-old's character. "That's Trent all over – his mentality, he's a very mature and strong boy for his age," said Henderson. "It's another good performance from him. It'll probably be sore in the morning but it shows the togetherness in the group. "In the warm-up he was struggling but he forgot about it in the game and did his job."